One of the more surprising entries in the Nintendo N&B Block series is the Ringer musical set. The N&B Block Ringer (リンガー) saw the light of day in 1970, a couple of years after the start of the N&B Block series (for more information read this post). Although some assembly was required, Ringer wasn't really about construction like the other N&B Block sets. The Ringer cost ¥1,200. Besides the N&B Block branding, it also sported the Nintendo Game "NG" logo, unlike any of the other N&B Block sets. The color orange must have been terribly en vogue in 1970, as the boxes of the Nintendo Kousenjuu light beam gun games released in that same year also use this bright color to great effect. The box is quite big and measures 52 by 28 centimeters. 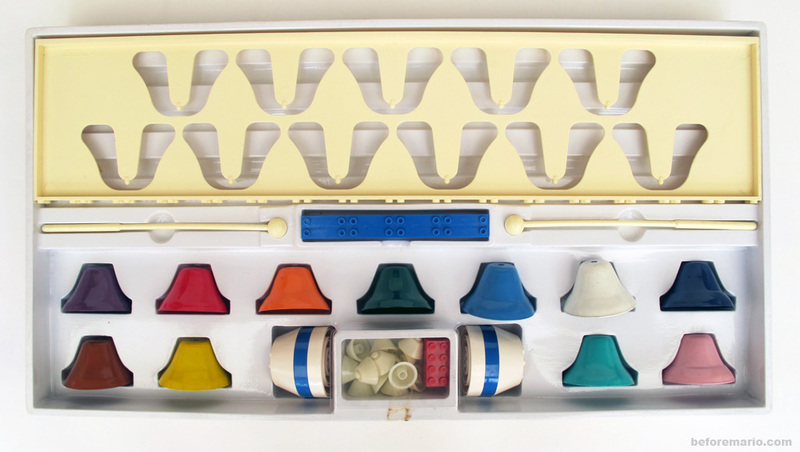 The Ringer set consists of eleven colorful bells and a frame to hold them, 27 N&B Block parts that need to be built on the frame following the provided instructions, two play sticks and a music sheet. Each of the bells produces a specific tone. A number is stamped in every bell, and they - obviously - need to be placed in the frame in the right order. The top of the frame is decorated with some N&B Block elements. Half of the blocks on top (the greenish ones) have a phosphorescence effect: they emit light in the dark after being exposed to light during the day. This is unique for the Ringer set; no other N&B Block set includes these type of blocks. The two bases of the frame of the Ringer are assembled from some standard N&B Block elements. The eleven bells together make up one and a half octave, from "la" to "re". 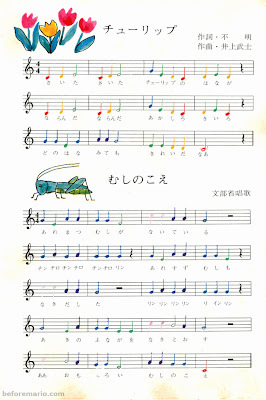 To start you off on a musical career, the provided music sheet contains six pages with a total of ten tunes. 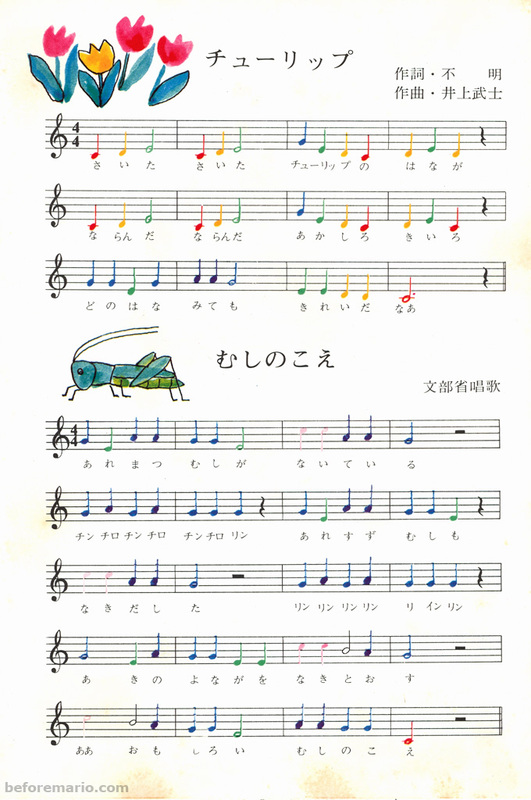 The color of the notes on the music sheet corresponds with the color of the bells, so it is not really needed to be able to read notes. The bright bells are very inviting, and produce a nice ringing sound. 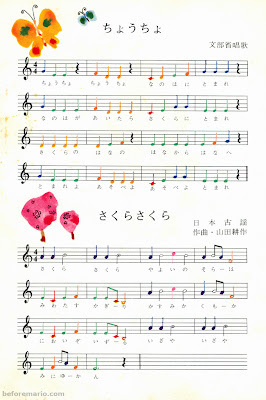 Are you ready to play "Sakura Sakura"? 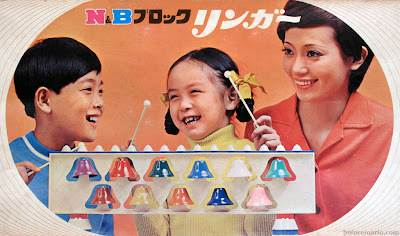 If you combine the Ringer with a Nintendo Ele-Conga, even more musical fun can be had. In the late 1970s and early 80s, the highly original Rubik's Cube created a world wide puzzle phenomenon. Nintendo quickly joined the party with the release of the Ten Billion barrel puzzle in 1980 and (less well-known) Crossover in 1981. Many years prior, however, Nintendo already released another puzzle game - called Challenge Dice. It is a fun puzzle; not too easy, but somewhat less challenging than the name would suggest. 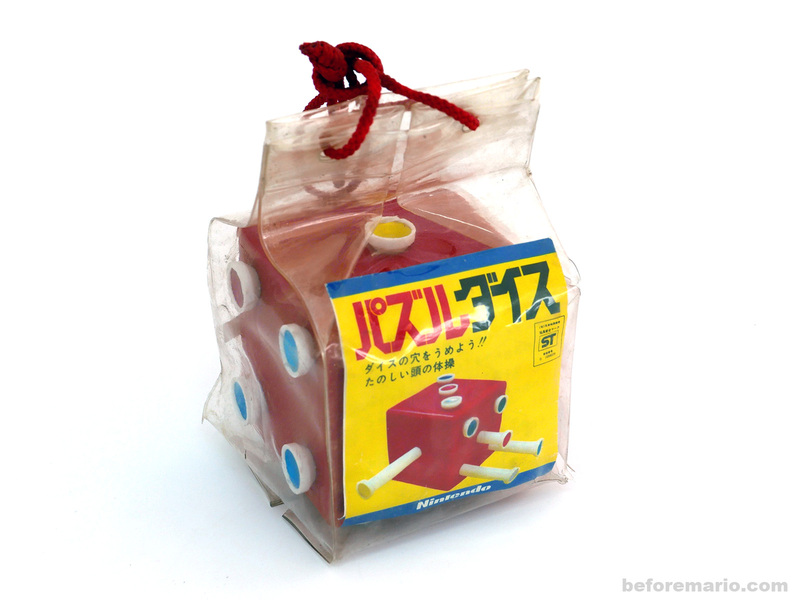 The Challenge Dice (チャレンジ ダイス) was released in 1969, and sold for ¥400. Playing cards were still an important part of Nintendo's business at the time, and a puzzle game was a natural extension of their portfolio, as cards and puzzles are often sold at the same places - so existing distribution channels could be used. The plastic puzzle cube was packaged in a transparent container, and came with a small twelve-page instruction booklet. The "one" side of the dice contains an embossed "Nintendo Patent Pending" message. The instruction booklet contains a Nintendo copyright sign. 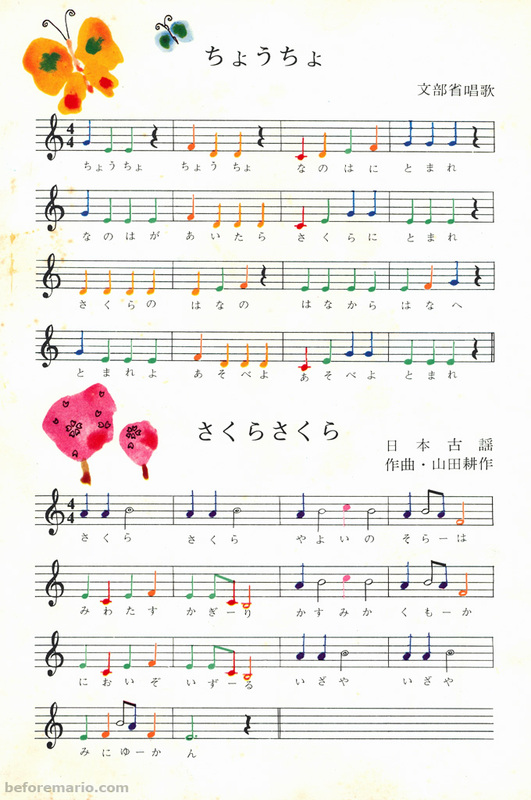 The inside of the booklet cover contains a sticker with an additional copyright notice: "(c) Sato Tokushu Design". It is not known what their involvement exactly consisted of, but possibly Nintendo's role was limited to production and distribution only, not design. The puzzle consists of a traditional dice, with one to six holes on the six sides of the cube. The holes need to be filled with a total of twenty-one pins in four different lengths. There are two pins of the largest size, eight of the smallest size and four and seven pins, respectively, of the sizes in between. The pins have different colors on their ends, depending on their size. To start the puzzle, all pins are removed from the Challenge Dice. The objective of the game is to put the pins back in. 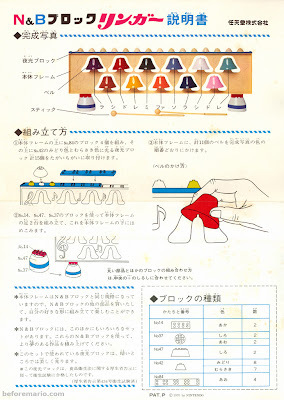 The smallest pins go in easily, but the longer pins can block each other on the inside of the dice, so their position needs to be selected carefully, to allow all pins to be inserted completely. If you want to, you can even disassemble the entire cube (it comes apart in six pieces), and include the assembly as part of the puzzle. It is quite easy to build, but you have to make sure you make the correct sides face each other ("one" opposite "six", "two" opposite "five" and "three" opposite "four"), otherwise it may not be possible to complete the puzzle. Multiple solutions exist for this puzzle. 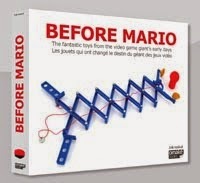 The instruction booklet provides two solutions, and encourages the puzzler to find more. 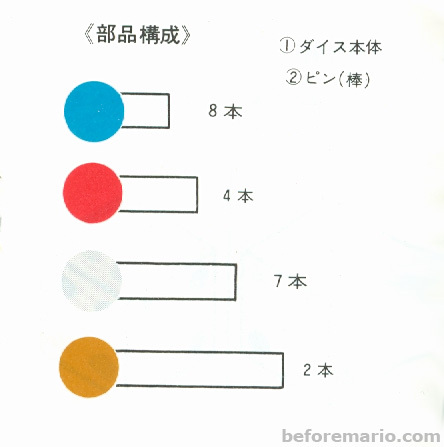 Space is provided in the booklet to note another 10 solutions, as apparently there are a total of twelve different solutions. As the smallest pieces always fit (they do not extend into the internal of the dice), the strategy is to focus on the other pins first. When these all fit, the smallest pieces can than be added to the remaining open spots. Challenge Dice was sold in three different colors: off-white, lime-green and red. The colors of the pins are the same for all three dice color variants. In the early 1970s, some years after the initial release of Challenge Dice, it was repacked under the name Puzzle Dice and also sold under its original name in the Nintendo Mini Game Series. Although the name would suggest differently, the Mini Game version is 100% identical (likely repackaged old stock), except that the cube does not come pre-assembled. The instruction booklet is also includes, as are (the same) instructions on the back of the blister pack. The Puzzle Dice version is also identical, except for its plastic bag and the instruction booklet. The Challenge Dice was also released abroad, under the name Chaotic Cube. This version surfaced in the US. The copyright notice on this version reads "(c) 1970 Pacific Game Company", and the brand name is "Pleaseantime Games". It came in a cardboard box. The slogan on the box states "Anyone can take it apart...that's easy...but to put it together again - Wow; that's a real puzzle!". When we open the box, that game that comes out is the actual Nintendo Challenge Dice game, in the transparent plastic container. The Nintendo patent pending mark is also still present on the dice. An English language instruction booklet is included. The booklet states "printed in Japan", which indicates that Nintendo produced the Chaotic Cube for the Pacific Game Company. The pictures on the box of the Chaotic Cube provide a clear step by step guide on how to go about solving this puzzle. 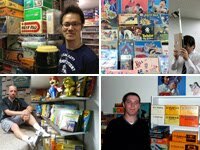 These photos are another indication of the involvement of Nintendo in the Chaotic Cube, as the exact same photos are also used on the front of the blister pack of the Challenge Dice in the Nintendo Mini Game Series, pictured above. Chaotic Cube was released in two different colors: red and green. Recently a third Western release of Challenge Dice surfaced, sold under the game's original name. More on this version can be found here. Another interesting find was this Chaotic Cube with outer cardboard box.